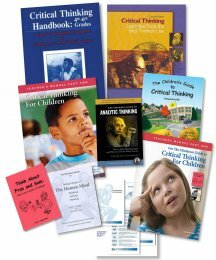 09BUND 4-6 Grade Teacher Bundle $159.95	 Qty. I am back in the classroom this year working with full-day kindergartners. Critical thinking remains at the forefront of my work as I embrace working with young minds. In the past three weeks of school we have already started naming our inferences and checking them to see if they are logical. I can't wait to see what we can do after 6 weeks! In addition, my work with the Colorado Department of Education came to fruition and the Foundation’s work is deeply embedded in the literacy standards under Research and Reasoning. I am pleased that the state recognized the quality of the Foundation’s work and adopted the standards last December. There have been many emails forwarded my way from educators in Colorado seeking clarity on what it means to teach critical thinking. I hope the emails continue. Again, thank you for the resources.